Hey everyone! Welcome to the Mama Elephant February Stampede! The stampede is extra special for two reasons: our new DT gals are joining us for their first stampede and we have the uber talented and so sweet, Laura Bassen, joining us too! Just like last month, you've already seen the first looks at the February release on the Mama Elephant blog, and went live on the site at midnight last night! The sun spray background of this first card was created with just a scrap piece of paper and some Distress Ink. At the bottom, I stamped 2 sentiments together and added a wee bit of sparkle with a glitter pen. I love the fact that Kryssi and Angela design sentiments that you can fill in. So versatile! To celebrate the new release, Mama Elephant is giving away 3 gift certificates worth $20 each to 3 lucky people! Winners will be chosen at random from the collective blogs in the Stampede. Winners will be announced on the blog Monday, February 18th. Come back tomorrow for the start of the DT stamp highlights! Can't wait to show you the new sets:) Thanks for stopping by and have a great day! Gorgeous background on the first card, and such a cute little boy card! Both cards are so pretty! I am in awe of your distress ink background - it is perfection! beautiful cards!! i love the little bit of glitter added to the sentiment on the first card! and the second card is such a wonderful 'moment' in time! what beautiful cards! These are both so gorgeous!!! Wow! Love them! Great job on the sun but I really love those kids' silhouettes. You can feel the breeze. Super idea to Polaroid him. JJ you are *such* a bad influence. I ended up ordering this set because of you. :-P Awesome projects, that sunshine card has me kinda giddy!! love your little boy card - mine are now in their 30s with their own boys! sigh. Love love love the sun burst card, and the sparkle you added. The second card is cute, but I think you need more enamel dots....JUST KIDDING!!! Seriously, very cute! Love the clouds/sky. 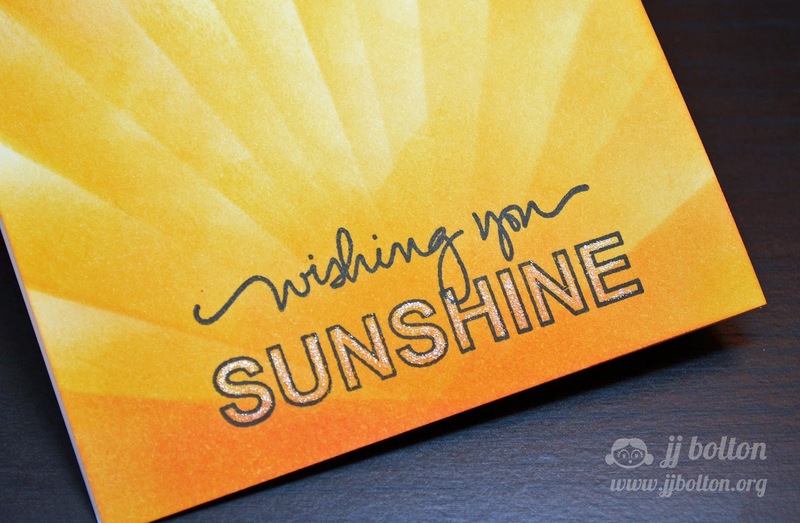 Love this sunny card and how you added the glittery effect to the word sunshine! Your innking is redic on that sunshine card and the way you made the window for the silhouette is perfect! Gosh JJ these are both so fabulous! Great cards! 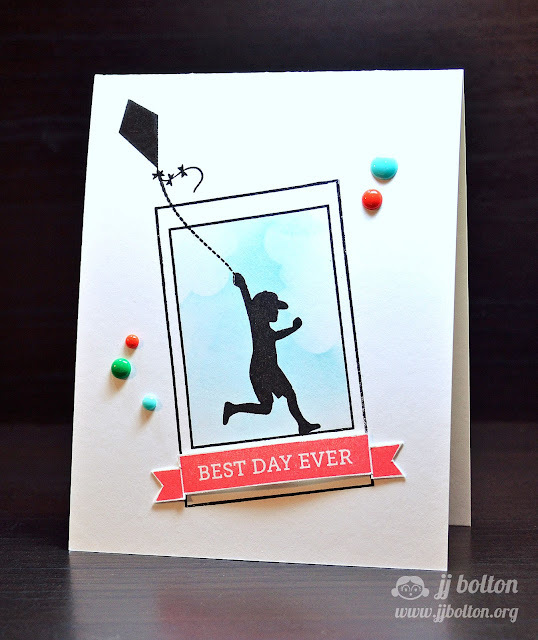 Love the bright and cheery colors on the first card and that sweet silhouette and kite on the second! I love both your cards, JJ! You really did a great job with these stamps! ..and I like ME on FB! As always, your cards are absolutely amazing! Thanks so much for sharing them with us! Love both of the cards. The sunshine one is my favorite! Your cards are AMAZING!!!! I love the second one so much! Love both cards but wow is the sunny card one I need! It's so bright and cheerful! Boy did you nail these two cards....awesome. Beautiful! I love the sunrays on the first card, and the cloud background on the second card is just sublime! Beautiful work! LOVE your cards! Especially the sun rays! These two cards are just brilliant. Great cards---I like the sun rays on the first and the silhouette against the clouds on the second. wow love the blending on the sun!!! I really like the picture coming to life in the second one. Beautiful work! already like you on fb yay! Love how you used the distressed inks on the first card. Also the pops of colour on the 2nd are perfect for the solid silhouettes. Great cards. Like the bright colours of the first one and the stamp image of the second is my fav set from this release. Thanks for the inspiration. that sunshine card so fabulous! I was not wanting to "like" any ME sets this month but what you've shown here has changed my mind JJ! Love that kite image soo much! These are so bright and fresh, JJ! I love them! wow! amazing inking on the first card and the second one is sooooo delightful! beautiful cards, JJ!! Just love both cards - beautiful sunray background on card one and darling scene on card two! Beautiful cards-love the warm sunny one esp! These are both AMAZING! I just love that little guys with the kite! What great cards!! both different, yet equally fabulous!!! great cards! love the sun card - this technique gives great results - this is one of my favorite sets - love the sentiments! Both cards are so fun - great sparkle on the first and what a cute boy silhouette in the polaroid frame with the popped up banner. Where do you get your awesome ideas from?? gorgeous card and background. my favorite on the hop! JJ, both cards just make me SO HAPPY! The glittery sunshine, and the happy boy flying a kit with the enamel dots ... huge smiles! Such cool cards, JJ--you always amaze me! Love the 3D Polaroid and I feel the warmth from your awesome sunshine card! Both cards are great! I love the sunny yellow card but, the Best Day Ever card is my favorite of the two. Gorgeous backgrounds here JJ! They are the perfect background for the clean graphic sentiments and images. JJ, you make me want these sets!! Bam! What great samples, love them! 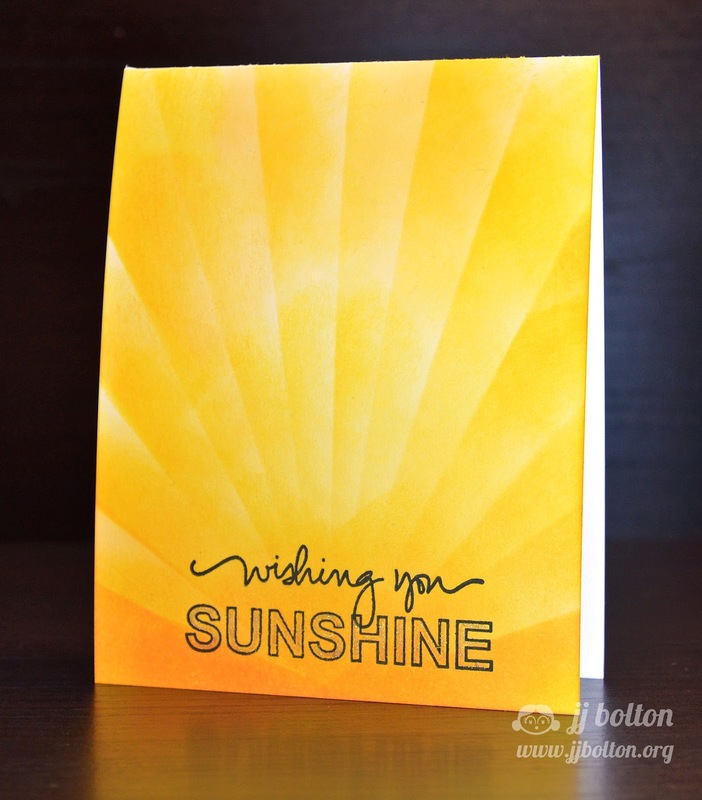 I love how bright and cheery your sunshine card is, that touch of sparkle in the outline letters is perfect. This is going to sound silly, but I love the random sprinkling of those enamel dots (WHERE do you get THOSE?!!) on your second card, they really add so much! I am already a FB fan and shared the news of the Stampede. Oh I love the second card!